I saw this story this morning and was interested in how well it displays problems with socialism. PARIS – The front lines of the latest French protest against raising the retirement age revealed a remarkable sight: Not the slightest wrinkle, not a single gray hair. Brandishing "Save our Pensions!" banners, students who haven't even entered the job market yet are already worried about what happens when they leave it. Welcome to France, where workers' rights are so deeply entwined into the culture that even teenagers are unsettled about plans to raise the retirement age from 60 to 62, which is still among the lowest in Europe. The reform protest brought nearly a million people out into the streets across the country Thursday. Young people fear they will lose the most from President Nicolas Sarkozy's pension reforms, which aim to cut France's ballooning deficit and make the money-losing pension system break even starting in 2018. This nicely demonstrates the entitlement mentality. Fiscal reality isn't important to them. It doesn't matter that there's no way to keep their pension system going the way it is presently organized. They want what's coming to them even though they haven't yet contributed to the system. They're in school, financed by by other taxpayers, and demanding more than 40 years in advance that taxpayers yet unborn bear the burden of their early retirements. Not that they'll go to the trouble of giving birth to those imaginary taxpayers. Shouldn't it be people in their 50's protesting the unexpected delay in their retirement? Maybe some are, though I haven't seen the stories. And maybe they're old enough to realize France has hit the point Margaret Thatcher is famously quoted as having brilliantly warned of: "The problem with socialism is that you eventually run out of other people's money." Julie Mandelbaum, a 23-year-old geopolitics student...says the government should tax high wage-earners and banks instead to ensure there is enough money for pensions when she retires. Oh, great idea Julie. Except banks don't pay taxes. They pass costs on to consumers through fee and rate hikes, just like any business does. So ultimately, she's saying she needs to pay more to cover her own retirement. I agree, though that's not really what she means, as indicated by the "top wage earners" line. Are there top wage earners in France any longer? I know personally a family that was doing really well, and emigrated here to leave the socialism behind (sorry guys, we're building it here despite watching it fail in Europe). French students are staying in university longer and doing more internships because it's difficult to get into the job market. That means many don't start paying into the pension system until their late 20s — yet the reforms require workers to pay for 42 years to get a full pension. Mandelbaum held a white placard with the equation, "27 + 42 equals 69." "We don't get a steady job until we're 27, if we have to pay taxes for 42 more years on top of that, there's no way we'll retire at 62, not if we want to have a full pension," she said. Wait, 42 whole years of work before you get to retire? That's just barbarian. What slave drivers the French government must be filled with to set such unreasonable expectations. I won't say 42 years of hard work, because it's nearly impossible to fire a bad worker in France, which is the reason French students have trouble finding jobs. Companies are so heavily taxed and regulated they can't afford many workers, and when they do hire they have to be really, really sure about the employee. It's often better not to hire anyone lest they be saddled with more dead weight. What's wrong with retiring at 69? Doesn't that socialized medicine in France mean a longer, healthier life expectancy? A few more years of work shouldn't be a big deal, since pension ages were set years ago when life expectancy was much lower. I do not understand how anyone can think it's a good idea for the U.S. to emulate these unsustainable systems. The BP oil spill in the Gulf of Mexico has a lot of people very upset, and with good cause. It's a disaster. We should do everything we can to limit, contain and mitigate damage. Information coming out during investigation indicates that BP was very irresponsible. A search on BP's safety record shows problems. Depending on what figures you find they've been cited for over 700 willful safety violations in the last few years. Other large companies have under 10 each in the same period. In short this oil spill is a dramatic tragedy that requires all the attention and all of the resources we can devote to it, and both BP and the government agencies responsible for overseeing them deserve tremendous condemnation. Procedures will need to be developed to help prevent any similar incidents. There is real hope for quick recovery from this spill. I've heard interviews with people saying you can still find oil under rocks in Alaska from the Exxon Valdez disaster. Perhaps a warmer environment and abundance of life helps do more to break down oil, because there don't seem to be such lingering effects from the Ixtoc I spill. We can't seem to get good estimates of the amount of oil pouring out of the BP well, or the total amount spilled, but estimates seem to put the volume per day and total at far less than Ixtoc I released. Mexico's state-0wned oil company Pemex was responsible for the accident, and 162 miles of U.S. coastline were affected. Pemex asserted sovereign immunity and refused to help pay for any clean up. Thanks, Mexico! But it didn't. Thirty-one years since the worst oil spill in North American history blanketed 150 miles of Texas beach, tourists noisily splash in the surf and turtles drag themselves into the dunes to lay eggs. "You look around and it's like the spill never happened,'' shrugs Tunnell, a marine biologist. "The environment in the Gulf of Mexico is used to coping with petroleum,'' says Tunnell. "The seabed is crisscrossed with petroleum reservoirs, and the equivalent of one to two supertankers full of oil leaks into the Gulf every year. The outcome of that is a huge population of bacteria that feed on oil and live along the shoreline." Source here. Once again, that doesn't mean humanity should do all it can. I'm only saying we have a potent ally in nature, and recovery may be significantly faster than the average person anticipates. Gulf residents, no doubt aware of the resilient nature of their environment, the rarity of these spills (twice in 30 years is a pretty good record) and their financial dependence on the industry, don't want offshore drilling to stop according to a recent poll. One thing the oil spill has not done is created a spike of opposition to offshore drilling in Louisiana. 77% of voters still support it with only 12% against. Only 31% say the spill has made them less inclined to be in favor of drilling while 42% say it hasn't made a difference to them and 28% say they're now stronger in their support. For the Obama administration, none of the above matters. Rahm Emmanuel is famously quoted as having said the administration should never let a crisis go to waste. Here's the quotation in the first few seconds of this clip (if you're interested, you can watch more of it). What exactly does he mean that you can do things during a crisis that you thought were out of reach? Politicians are aware that there's a range of policy and actions the public will accept. Act outside of that acceptable range, and you lose office. This concept was expressed by Joseph Overton as "The Overton Window." A crisis can cause that window to shift, allowing for policies that would have seemed too extreme in the past. President Obama has expressed a specific agenda for energy. He wants to make it very expensive so that we use less of it. Remember, during the 2008 campaign, there was a spike in gas prices. Then campaigning Senator Obama wasn't troubled by very high gasoline prices despite the hardship that poses to working families. He was just unhappy with how quickly they'd increased. In fact, Cap and Trade isn't about reducing carbon emissions. It's about making energy prohibitively expensive. The tax revenue government would gain at your expense is a secondary objective. The very real connection with the current oil spill in the gulf is that the administration smells not just oil, but blood in the water. The heart-wrenching images of oil-drenched birds and constant cries of permanent ecological damage on the news have shifted the Overton Window. Passage of a Cap and Trade bill as some sort of energy reform bill is very possible given current public sentiment. President Obama announced a 6 month moratorium on new oil drilling in the Gulf. That would have been unacceptable prior to this spill, because it will raise energy prices over time. Prior to the gulf spill, the administration had quietly moved to make U.S. resources unavailable in ways the public wouldn't really notice. * Now they can move quickly to shut down production. In addition, they'll try to pass a cap and trade bill that will raise gas prices to at least $7 per gallon according to a Harvard study cited in this op ed column. The study itself actually seems to indicate $8 per gallon gasoline. That's a move no one would have accepted prior to this spill. Once the agenda behind it is clear, I hope it's a move we still won't accept, as it would destroy our already fragile economy. *In case the link ever expires, the article is about HR 1018, ostensibly designed to amend the Wild Free-Roaming Horses and Burros Act to improve the management and long-term health of wild free-roaming horses and burros. The 700 million dollar legislation to acquired more land for the horses that just happens to be loaded with oil and natural gas. The pressing question to ask is if this is our politicians trying to suppress domestic energy or is it just a land and money grab? That's my slightly more fact-based take on the information at Gateway Pundit. Their headline? The reality is horrifying enough. Rather than control our own border, signs have been posted telling people to stay out of a region fully 80 miles into the US because of violence from Mexico. Click through for the interview with a local sheriff. 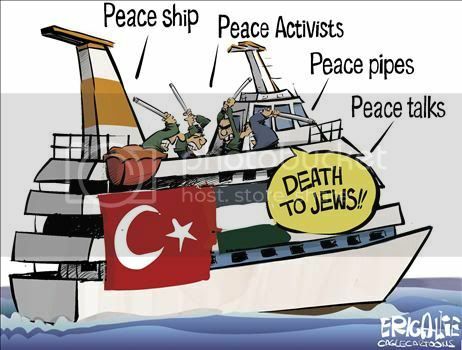 I have some serious thoughts about the Palestinian "aid" ships that tried to run Israel's blockade of Gaza. They include alarm at the world's wide-eyed acceptance that these aid workers were intent only on helping Palestinians, despite videos of them preparing by chanting Jihad messages, arranging weapons, and getting ready to attack Israelis. These people considered it a win whether they made it through or elicited undeserved world sympathy through their actions. However, it's time for some gallows humor on the matter, and some people have done a great job of it. If you haven't followed the saga of President Obama's aunt Zeituni, you really should. She's an illegal alien who's been living in public housing in Boston for years. Of course, after being ordered deported multiple times, somehow she's gotten asylum from Kenya. Asylum? From Kenya? It's one thing for President Obama to criticize the AZ law without reading it, or for everyone in his administration to criticize it without reading it (such as Eric Holder and Janet Napolitano). It's another thing entirely when John Morton (head of ICE--Immigration and Custom Enforcement) announced a few weeks ago that "his agency will not necessarily process illegal immigrants referred to them by Arizona officials." I haven't wanted to post this, because the implications are so dire. This is what civil wars and revolutions are made of. An executive simply refuses to enforce a legally enacted and obviously constitutional law. There are two things that define our country. 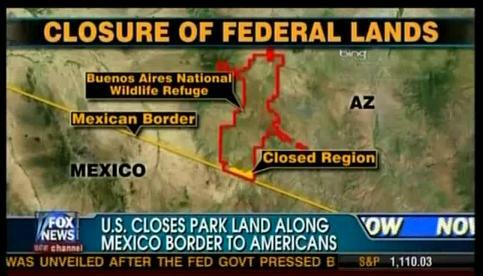 Our laws and our borders. ICE is openly refusing to enforce both, and President Obama said the same about our borders, standing next to the president of Mexico. Now we have serious questions that Obama attempted to bribe Joe Sestack out of running for Arlen Specter's senate seat. We are no longer a nation of laws. Hopefully our elections will still be respected, and we can do something about it in November.